I Live In A Fictional World: GIVEAWAY!!! Okay. I've been sitting on this giveaway for a little while now. It's the first giveaway I'm hosting so I hope you like it! This giveaway will run from November 12th to November 20th. 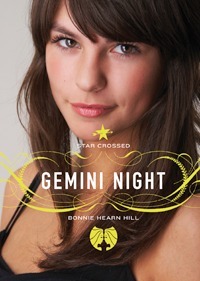 STAR CROSSED: GEMINI NIGHT finds Logan McRae home from Writers Camp with a new mentor, a new boyfriend, a possible internship with the brand-new and highly anticipated CRUSH magazine, and an even stronger belief in the authority of astrology. As usual, trouble catches up with Logan fast. With the help of her two best friends, Paige and Chili, Logan hopes to get a handle on everything before disaster strikes. Weighed down by a troubled heart and nasty rumors at school, it won’t be easy, but Logan’s has the stars on her side. Here are all 3 titles in the Star Crossed Series: Aries Rising, Taurus Eyes and Gemini Night. Here's what you have to do. You get one entry point for being a follower of my blog. You must leave a comment for another entry point telling me what your zodiac sign is and what you love about being that sign. Another entry point if you follow me on Twitter @elaineblogs. If you have a tattoo of your sign, and you send me a picture of it (bloggerful_1@yahoo.com), I will give you an additional two (2) entry points. In the spirit of this giveaway, here is a picture of my zodiac sign tattoo and what I love about being a CANCER!!! 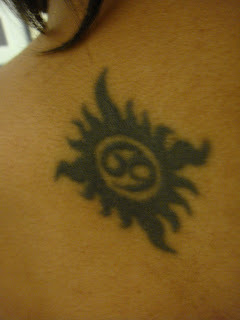 This was my very first tattoo (I have 4) I got when I was 17. It is located at the top of my back - which, I can't tell you how hard it was to get a picture of by myself! I love being a cancerian because we are ruled by our emotions. We feel everything deeply, good or bad and everything in between! Just like the crab, we are hard on the outside but soft, squishy and delicious with butter on the inside! The very best part is sharing my sun sign and exact birthday with my best friend! DON'T FORGET - GIVEAWAY ENDS NOVEMBER 20TH!! I want to start by saying I love being on the cusp of Gemini and Cancer. I get to blame everything on one or the other! In all seriousness, being on the Twelfth House Cusp of Gemini and the First House Cusp of Cancer really portrays itself during two completely different times. First one is my favorite of all. When I am in a social scene I can get along with everyone, and I can make friends quickly. (Good ole’ Gemini for you) and on the flipside when I want to sit down and just stay home, I can literally stay home and do NOTHING. I can sit on a sofa with no tv for hours, and be self content. The second zodiac sign that "shows” is when I get into an argument with a loved one. Now given, I do not necessarily “love” this one, I am always amused when it happens. During the argument I will slowly shut down and stop listening (CANCER ALL THE WAY BABY!) but then feel bad that I’m arguing with the person and try to apologize for something I didn’t do! (Good Ole’ Gemini again!) Sorry, I don’t have a tattoo of the Gemini twins, or a crab on me, Want a picture of my other ones? I can't believe I forgot to include a picture of the book! Thank you Ashley! +1 Leo - its strong!